The Chipstead Lake Physiotherapy Department is situated in a new, state of the art, stylish Suite. The Suite is air conditioned and has adapted equipment designed for use by all residential service users, is open 5 days a week and is fully accessible. Physiotherapist Dee Gilbert is available to offer advice and support to service users to develop their own individual therapy programme. Maintain or improve existing mobility skills. Promote good health and increase exercise tolerance. Maintain independence by assisting individuals to do as much as they can for themselves. Reduce the likelihood of developing secondary complications such as pressure sores, joint stiffness and chest infections. Ensure that individuals have comfortable and supportive wheelchair seating and equipment that support their well being. Treatment sessions are flexible. The suite is open 9.30 to 3 and service users can use the facility as often or as little they like. Three active/passive motorised cycles, two of which can be used to exercise both arms and legs. The cycles are accessed from wheelchairs and can either be used in active mode, using variable resistance to maintain or increase muscle strength, or if muscle is very weak the cycles can be used in passive mode, which keeps joints mobile and stimulates the circulation. 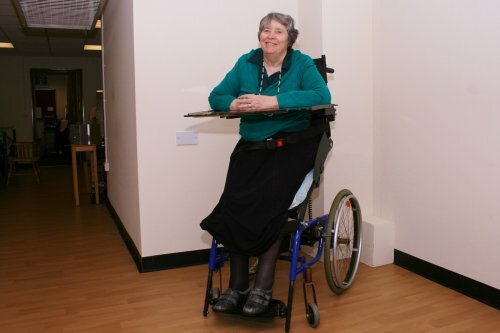 Standing frames/aids which facilitate supported standing can be used by individuals who have adequate range of movement in their hips and knees. The frames provide different levels of support where users can enjoy the feeling of standing while stretching their legs and spine and reducing tight muscle tone. Parallel bars for assisted walking and various walking frames that can be used as part of their therapy programme. Weight and pulley machine for whole body strengthening exercise. A weekly exercise class which is held in the Resource Centre. The hour long class starts with exercises to music, which includes toning and stretching exercises for the whole body experience followed by ball games and fun activities. Chest therapy is provided for service users who develop chest infections and are unable to clear secretions from their lungs. Weekly hydrotherapy is available for 1 or 2 service users using the hydrotherapy pool at Seven Springs, Leonard Cheshire Disability. The service users have one to one supervision whilst in the pool and have a program combining exercise, standing and walking where possible, swimming and relaxation supported by buoyancy aids. Wheelchair and seating assessments and repairs. The physiotherapist refers service users to the NHS Kent Wheelchair Assessment Service or to private providers and participates in assessment for both powered and manual wheelchairs, specialised seating systems and pressure cushions. Thereafter the chairs and equipment provided are monitored for continuing suitability as individual needs change. When required the physiotherapist makes referrals to the occupational therapist from the Environmental Control Service. This NHS service is used by people who no longer have good hand skills. It enables them to once again control their TV and CD remotes, lights and room fans. The physiotherapist also liaises with other health care professionals on behalf of the service user and provides progress reports for follow up clinics. The above services are available to any service user living in the main home. The physiotherapy suite is also available for private clients by arrangement. On Tuesday afternoons at 13.30 to 14.50 the physiotherapy department facilitates a group physiotherapy session. This session is for a maximum of four people who do a circuit of different activities. Sessions cost £15.00. This session is open to private clients. The motomed cycles and the weight machine can be booked for half hour sessions. This will enable private clients to use the equipment. A 30 minute session is £5 and can be booked between 13.50 and 14.50 Monday to Friday (excluding Tuesdays). These sessions are open to private clients. The private services must be pre-booked. There is an initial 30 minute consultation with the physiotherapist before any private sessions. Invoices are issued on a monthly basis. The above private service is available to any disabled person.